Decorated musician Duffy King performed on Thursday night at Tulip Time. 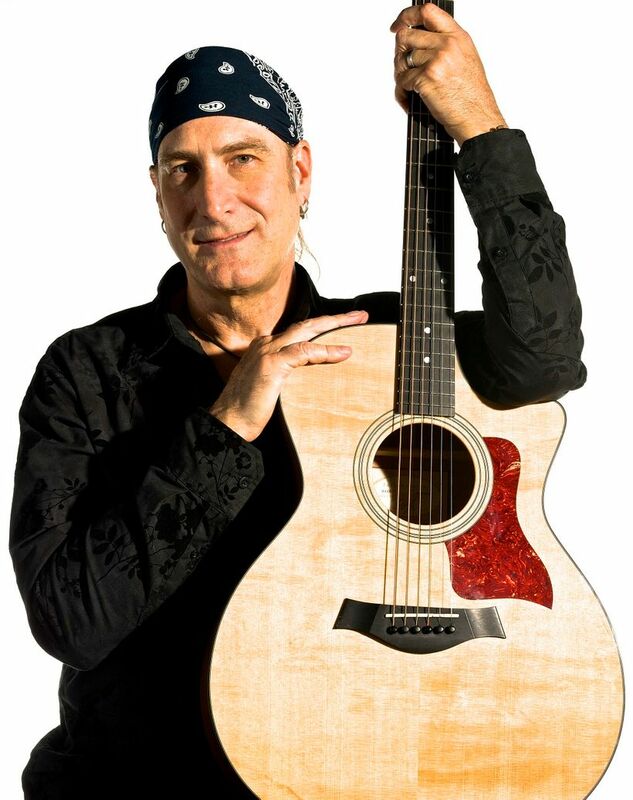 Starting at 8pm, the Knickerbocker theatre hosted the music legend for his show called Acoustically Speaking. The performance was based off King’s recent album of the same name. The show started with King on stage alone with an acoustic guitar wearing dark pants, a blazer, and he had a bandana wrapped around his long hair. With just the guitar, King also used a looper and sampler, octoboxes and harmony boxes to add texture to the song. Acoustically Speaking is an all original acoustic album with influences of Latin jazz, fusion jazz, modern acoustic guitar and R&B influences. King said the album was born out of writing songs for his wife, who is a flamenco dancer. King is a Detroit-born musician whose style is described as “energetic, kinetic grooves, driving rhythms, searing, blistering leads, finesse and feel.” He has won six Detroit Music Awards, and it was his latest album that was submitted to the 59th Annual Grammy Awards. The performance on Thursday night was a display of King’s skills as a talented guitarist, vocalist and songwriter. He strummed and plucked his guitar throughout the night, changing up his technique. The band matched the pace of King’s playing, giving the audience a unique blend of music to groove along to. Duffy King is a guitar aficionado. His styles range from Rhythm and Blues, to Jazz/Rock and Flamenco to Bluegrass. His guitar playing has been described as “energetic kinetic grooves, driving rhythms, and searing, blistering leads.” Duffy is best known for his potent Jazz/Rock and R&B/Funk chops. When you read about who Duffy has performed or recorded with it reads like a who’s who of musical royalty: Marshall Tucker Band, Earl Klugh, Tony Franklin(Whitesnake), Rare Earth, Oteil Burbridge (Allman Bros, Eric Clapton, Carlos Santana) and Ralph Armstrong (Frank Zappa) and the list keeps growing. 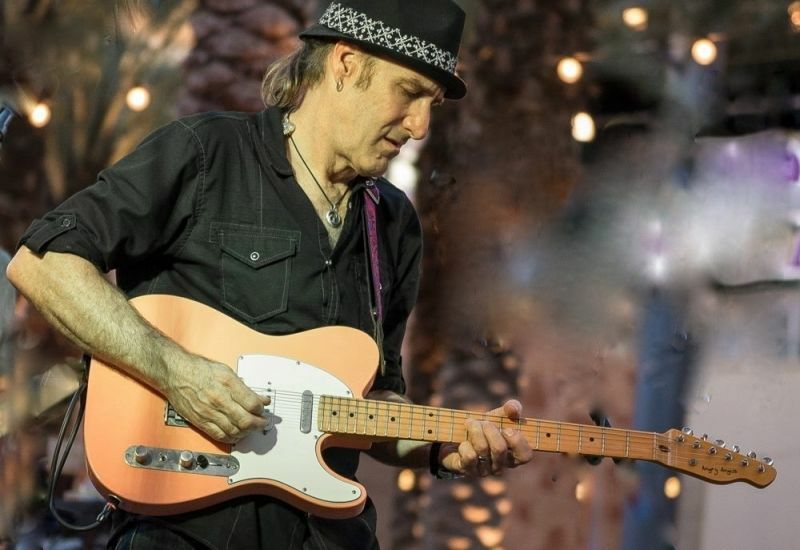 Most recently Duffy King was chosen to play guitar for John Lodge the longtime bassist of The Moody Blues and his latest band 10,000 Light Years. Duffy King grew up in Detroit Michigan, and became a full-time musician in 1978. Married to wife Karen, he lives with her and their 16-year-old son, splitting their time these days, when he’s not on tour, between the Metro Detroit area and their studio on a lake in Northern Michigan. His accomplishments are impressive. Over the years, he’s received 20 Detroit Music Award nominations, actually winning 6 of the awards. Duffy’s talent doesn’t stop with playing guitar. His songwriting skills have won awards in Billboard Magazine’s Songwriter’s Contest, and he received acclaim for his solo release, Livin’ for the Big Time, which charted in the top 10 on many radio stations throughout the mid-west region of the US. He was nominated in the Detroit Music Awards in 1999, 2001, 2002 and 2003 for Outstanding Guitarist in the Rhythm and Blues Category and his 2002 CD release, “Solo Guitar Christmas“, was nominated for Record of the Year in the 2003 Jazz Category. In 1995 and 1996 Duffy performed clinic/promotional tours for the Gibson Guitar Corporation worldwide, performing in the Winter and Summer NAMM expo shows in Frankfurt, Germany - Lucerne, Switzerland - Paris, France - Tokyo, Japan, where he could combine his musicality, and his wonderful humor to create an entertaining and productive clinic, knocking them dead everywhere they traveled. Other companies he’s performed clinics for include, Yamaha Guitars and Amplifiers, Egnater Amplification and Rocktron. He was the featured guitarist on Motley Crue drummer Tommy Lee’s solo project, Methods of Mayhem 2010 release, “A Public Disservice,” in addition to being the featured guitarist on gold and platinum, international Polygram artist, World Music Award winner, Matthias Reim‘s recording Reim 3. In 2001 Duffy composed the music for a short film, The Maiden Mirror by independent filmmaker Jennifer Machiorlatti, and produced and performed the music for 2 National Chevrolet ads. In 2016 Duffy produced a new album called Acoustically Speaking. It was submitted for the 59th Annual Grammy Awards and garnered rave reviews from journalists and musicians alike. It’s been played on Jazz radio extensively throughout the US and Canada reaching several Top 10 lists and a few Top 5 lists.. It featured 8 tracks all written by Duffy King ( he co-wrote Sophie’s Sonata with Bill Dutcher and Black Onyx with Rob Emanuel.) It’s an excursion into Latin/jazz, acoustic fusion, and “modern acoustic guitar” compositions. Alan Hewitt, Duffy’s best friend since he was a teenager, and Duffy have played together in many bands throughout their career. In 2015 they had a fusion super-group called Allan Hewitt & One Nation, which consisted of Alan, Duffy King, Sonny Emory on drums, Jamie Glaser also on guitar, and JV Collier on bass. The bands pedigree earned them a super-group handle as past players from Jean Luc Ponty, Steely Dan, Lee Rittenour, Herbie Hancock, Chick Corea, Earth Wind & Fire, and Bruce Hornsby. They released a highly-acclaimed album on Sony/RED called Evolution. As we struggle, in the current climate in our country, to define what makes a man “strong”, it’s been refreshing to see Duffy King’s success. His guitar technique is supreme. He’s a cool guy, who has immense depth, determination, respect for women, and a great sense of humor. He doesn’t care where you come from, but only where you’re headed. We wish Duffy the best of luck and hope you’ll check out his music. He’s a nice guy and he plays one hell of a guitar. spotlight his remarkable dexterity and commitment to groove.. Highlighting as jazzy, nylon-string sound on “Danza del Sol” (Dance of the Sun), our selection, King at times evinces Wes Montgomery before he dives into full-on string blurring flamenco. Meanwhile, bassist Felix Sainz maintains the central pulse around which the song revolves around, as drummer Rob Emanuel and percussionist Perry Senn keep the rhythmic engine stoked. King has won significant acclaim for his mastery, including nominations for Grammy, World Music and Billboard Magazine awards. On the inner jacket to Acoustically Speaking, Duffy King's second CD as a leader, the reader is informed that the Detroit-based maestro plays acoustic and six-string guitars (plural). While that is presumably true (all guitars sound basically alike to some untrained ears), there's no doubt that King plays all of them quite well, as should be expected from a sovereign. When not swapping guitars, King composes, and does that quite well too; he wrote or co-wrote each of the album's eight selections, unveiling a special knack for designing handsome melodies and tantalizing rhythms. Group size and instrumentation vary from track to track, with King playing alone (with electronic help) on the erratic "My Loopy Brain" (which ends, quite curiously, in mid-note) and "Mystic Road," on which he also dispenses a vociferous and largely incoherent background vocal. Bassist Felix Sainz appears on three tracks, percussionist Perry Senn and drummer Rob Emanuel on two. King and guitarist Bill Dutcher duet on the lyrical "Sophie's Sonata," which they co-wrote, while bassist Roger Noonan and drummer (and co-writer) Emanuel make it a trio on "Black Onyx." King opens with the charming "Cancion para mi Karen" (Song for my Karen), on which wife Karen King plays castanets and special guest Adam Ben Ezra adds double bass and percussion. Speaking of bass, the aptly named Joe Bass plucks away on the second track, King's propulsive "Perfect Day." The high-octane "Danza del Sol" opens with a riff reminiscent of Buddy Rich's "Away We Go" before King takes charge with more of his six-string sorcery, and the session ends with King's "Samba del Sonoran," on which he, Sainz and Penn set a sprightly course and stay with it until dropping anchor. Even though the temperature seldom dips below steamy, there's a lot to like on Acoustically Speaking, thanks for the most part to King's mastery of his guitars (plural). If there's a downside, it lies in the album's slender forty-one-minute running time. Track Listing: Cancion para mi Karen; Perfect Day; Sophie’s Sonata; My Loopy Brain; Black Onyx; Danza del Sol; Mystic Road; Samba del Sonoran. Personnel: Duffy King: guitars, percussion, background vocal (7); Adam Ben Ezra: bass, percussion (1); Felix Sainz: bass (1, 4, 8); Karen King: castanets (1); Joe Bass: bass (2); Jim Pryor: drums (2); Bill Dutcher: guitar (3); Rob Emanuel: drums, percussion (4, 6); Perry Senn: percussion (4, 8); Roger Noonan: bass (6). 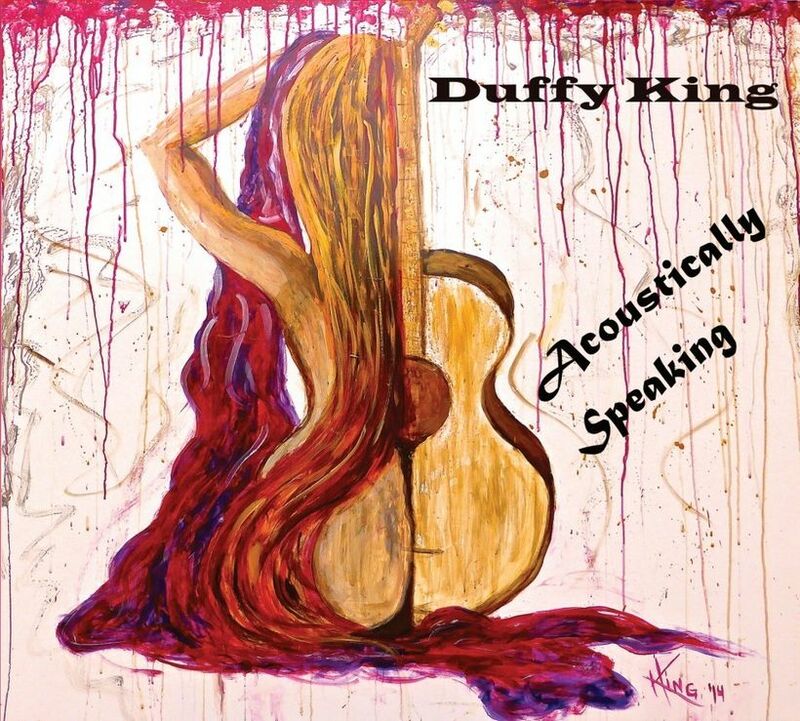 DUFFY KING/Acoustically Speaking: A cat that's driven more stuff from the background than you can imagine, the guitarist crafts a set that harks back to the home grown acoustic/solo guitar records from the 70s underground that got you hooked on this sound and vibe in the first place. Super tasty stuff for acoustic music fans, King is aiming for the heart rather than the chart here and he hit's the target dead center. A wise, wily set that isn't for laid back times, he really gets you going here and it's nice to have his own chops front and center to really get a taste of what he's about and can do on his own. Well done. Duffy kicks his evening up starting off his set with some rock and impressive driving beats. His influences range from R&B and Funk to Jazz and Rock. They are clear and present in the sweep to sound and energy emulating from this seasoned musician and performer. Solid singing and magnificent guitar make it easy to see why his resume is so impressive. Duffy is also an incredible songwriter that has mastered the flow of storytelling. The performance leaves you energized and inspired to go home and pick up the guitar. It was truly an experience I will not forget anytime soon. It is also great to hear the vocals from Alex Boye, who seems to be moving places really fast, while Orianthi, as always, is technically superb, without over-dominating the songs. Another standout performer is Duffy King who rips his electrifying six-string through some of the most wondrous pieces.Alan Hewitt has had the honor of working as Co-Producer alongside Maurice White of Earth Wind and Fire (EWF) for over half a decade with EWF’s Greatest Hits album going platinum in 2000. His co-writing and piano/B-3 contributions on the platinum record Cherry Pie with Warrant solidified Hewitt as a musical talent. Besides being the keyboardist for legendary rock band The Moody Blues, and touring with them worldwide since 2010, Hewitt’s list of record production credits – as both a producer and recording artist – spans across various major labels and genres with over 12 million records sold. alan-hewitt- as a solo artist, Hewitt draws from the diverse worlds of contemporary jazz, fusion, pop and rock. It was his 2004 release, Noche de Pasion, that marked his emergence on the instrumental scene, which was followed by his critically acclaimed 2006 release Metropolis. His newest CD, Alan Hewitt & One Nation “Evolution” is a fusion of rock, jazz an prog. Alan is featured on piano and keyboards and he is joined by JV Collier (Bruce Hornsby Noisemakers) Grammy winner, Sonny Emory (Steely Dan, Earth, Wind & Fire, Stanley Clark) Jamie Glaser (Anderson/Ponty Band, Chick Corea’s Electrik Band, Lenny White Band) guitarist Duffy King and also special guests Orianthi (Michael Jackson, Alice Cooper) and #1 YouTube Artist of the Year Alex Boye. Another outstanding trio recording to add to the list (and this one being live to boot), with Charles David Stuart on drums and percussion, Duffy King on guitar, James Simonson on Bass and Mark Byerly on trumpet. Seven tracks, not to be missed. (Excerpts of emails and internet posts, sent to Duffy King)Location:Newbury MA CD arrived last week, I only just loaded it into itunes and listened to it by the tree and the fire. I REALLY sincerely and truly like it!! I was afraid that it would be dorky guitaristic tasteless crap (not you of course, but because so many things are, like much of my "merry axxmass" CD with vai and satriani et. al. ; I hate when people buy me that kind of stuff). I am delighted that I liked your CD aesthetically immediately. It showed the heart that created it. You breathed new life into these tunes without being clever for the sake of it; the ballads were lovely, the "up" tunes were lively, always tasteful, just great. Some of my favorite tunes too. Good music, not just good guitar music. But speaking of guitar, nice arrangements, good voicings, nice ideas and cool stuff hidden in there, nice tone, nice articulation. You're a terrific player; but there's a person in there, a good heart and soul. So a pleasure to listen to, and I mean that. I'll listen to it every year.So it's good to hear a guy like you who can play well but doesn't make me get sleepy. Great job! Bill W. Location:MI Duffy, I saw you for the first time at Uptown Friday. Yea the guy that bought your CD. Well after ripping it open the second I got in the car I stopped calling myself a musician after seeing you perform and listening to your CD. You blew me away. Not to get mushy but you hold that axe like a man holds a beautiful woman, and you make her sing a beautiful tune. More so and more important, your Christmas Cd touched my heart so deeply it finally got me in the Christmas spirit. Its when a man can touch another human being in the very place a heart beats that makes him special and for me your playin' and your CD did just that. Sir you are something very special and I hope you find joy that your music is just not something to listen to but touched another human beings heart! I will promote you to know end and will buy your CD's. You can "feel" the music on that Christmas CD.........incredible. I love that genre' of playing..........your mother should be so proud. I went to rehearsal the next day and said guys you need to hear this.........you have more fans coming! Merry Christmas and God Bless you Duffy King! David F Location: New Jersey "Duffy Is King!! Christmas Cd!! I just recieved Duffy Kings solo X mas guitar Cd. WOW!! WHAT a treat! Absolute top notch playing. From the song selection, arangements, and production, to the finger twisting chordbassline melody playing, it is just a seminar on taste and feel. Every song has something to catch your ear. If its not a cool reharmonization or chord sub, its a syncopated bassline, or flawlessly executed bell like harmonic excursion. Not a single moment of wanking, or internet like self indulgent flash. "We Three Kings" and "Little drummer boy" had the tears in my eyes and gave me goosebumps all over. I have lisetend to it about 6-7 consecutive times, and every song STILL catches me with something unique. Obviously, Duffman put a LOT of time and effort into this, and it was WELL worth it. You are the man Duffy! You should be EXTREMELY proud of the entire project. It is one of my favorite Christmas Cds, and I will be enjoying it every single year I am on this earth. Everyone NEEDS a copy of this. This guy is a TOTAL profesional, and world class playermusician. Thanks Bro!" //////// Location: willits, northern CA "I bought the CD the moment Duffy put the clip up here. What a player!! !It's playing right now!!! Oh my!! It's sooooo good. I'll be placing a large order for xmas presents. jon"/////// Location: Cherry Hill, NJ "Listening now! Awesome work Duffy. Loved the Ted Green tone! Thanks a lot!! Scott"/////// "God Rest Ye Merry Gentlemen " even Scrooge would like. If you make an encore CD next year Duffy, count me in !! "///// "I got mine last week, slipped it into the "Holiday Music" selection my wife is fond of playing during this season. She dug it, my kids dug it and I am now a HUGE Duffy fan. It is just gorgeous stuff, well played and arranged... Scott Peterson" "Dear Duffy, this is a rather facinating release- a one-man-and-an-electric-guitar album of Christmas carols! I hope to get your album in timefor Christmas; it's that good! Brook Crowley" >//// "Duffy, as the cd started spinning in my jeep. i thought ..."what a kewl idea" the magic that you had captured was that of your own style, which in this day and age seems to be lost at times. the guitar playing was supurb (harmonic notes) were very well placed . i will enjoy this cd for many years to come. thank you! regards, brian hamilton bananastudios, bobcaygeon,ont. ">//////// "Dear Duffy, I've been hearing about you for sometime from my friend Lorie. When Lorie came down to Florida during the holiday she brought your solo guitar CD to me. I absolutely love it!! Your style reminds me of Lee Rittenour(whom I've loved for a longtime.) Your interpretations of the Christmas songs are soothing yet entertaining. I look forward to hearing more of your music." ////////// "Duffy, I just wanted to drop a line and let you know how much I enjoyed your Solo Guitar Christmas Album. Your mom sent one to me and it has been my favorite record during the holiday season. I've played it for all my family and they join me in thanking you for such a memorable music experience. Janice Donnelly" //////////// "Hi Duffy, Your cd sounds great! larry barris" ///////////////"Duffy, your CD is quickly becoming my favorite Christmas music. Thank you. Lorie LaGalo>" ////////////////// "Duffy, you are one fabulous Guitar Player-Man you did one hell of a job on this Cd. I Love It!!! You are, without a doubt one of the best Guitar Players around. Sincerely, Simone Vital" /////////////// "Hi Duffy, I read about your CD in the Straitsland so I hurried up and bought it. I absolutely love it. All the kids like it too. I have been playing it all morning in my classes at ILHS and tell them all about you. Have a nice Christmas. Mrs. H"